The Team Bulls pair of Simon Stiebjahn and Tim Bohme finished the Bridge Cape Pioneer Trek international mountain bike stage race on Saturday like they started it a week ago - with a stage win - in the process extending their lead to secure the overall title. In the women’s event, it was the South Africans Candice Neethling and Cherise Stander (#iride4Burry) who won the event’s final stage, but the overall title went to the Asrin Cycling pair of Catherine Williamson (GBR) and Alice Pirard (BEL). Stage 6, an 86km leg from Herold to Oudtshoorn took place in warm, sunny conditions, stark contrast to the final rain-flooded last stage a year ago. And what was anticipated to be a relatively tame finale became a fiercely contested affair. Eager to put Team Bulls under pressure in the hope that they could reclaim some lost time and possibly the overall win, the South African duo of Philip Buys and Matthys Beukes (SCOTT Factory Racing) were the early aggressors. But with 30km remaining, on the rough jeep track trails of the Chandelier Game and Ostrich Farm, Stiebjahn and Bohme took control and increased the pace, leaving the field in tatters behind them. They opened a gap on the field with only Asrin Cycling’s James Reid (RSA) and Herman Persteiner (AUT) able to join them, setting up a two-team duel for the stage. Asrin Cycling were unable to tame Team Bulls though and the Germans claimed the win a time of two hours 28 minutes 55 seconds, neatly bookending their campaign after having won the opening prologue stage. Asrin Cycling had to settle for second on the stage, but moved up one place on the General Classification to fourth. Third on the stage was the EAI Cycling duo of Gawie Combrinck (RSA) and Johann Rabie (RSA), former road racing pros, who finished third overall. 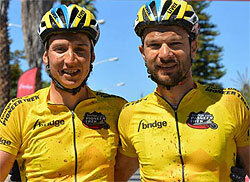 Buys and Beukes were home fourth and sealed their second spot on the GC, conceding more time to their German rivals. The seven-day race, which attracted over 400 riders from 15 nations, ultimately became a duel between SCOTT Factory Racing and Team Bulls, who swapped the race lead and claimed all the stage wins between them, Buys and Beukes claiming four and Stiebjahn and Bohme winning three. “The profile of the last stage was not ideal, but there were a few small climbs near the end so Tom and me decided to go hard there. We felt the best way to defend our lead was to attack. We knew that if we got a gap we might break the SCOTT guys mentally. And it worked,” said Stiebjahn. “The sprint worked out well too. The Asrin guys were actually riding to move up the GC, so they had already put in a big effort and we were able to get away with about 500 metres to go and stayed away,” explained Stiebjahn. “We’re very happy with this result. 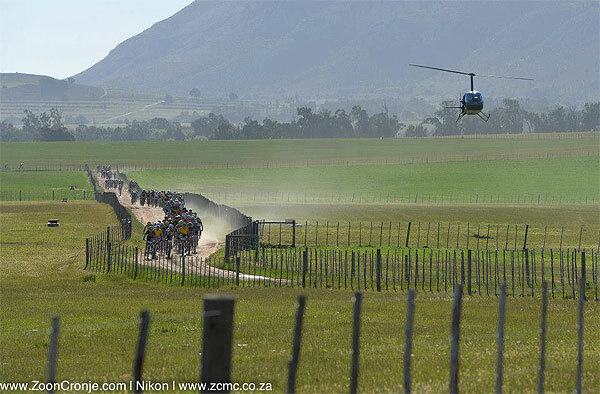 The Cape Pioneer Trek is a great preparation race for the Cape Epic. Tim and me were third at the Cape Epic this year in our first stage race together. We came to the Cape Pioneer Trek to use it for Cape Epic preparation because it’s quite similar in many ways,” added Stiebjahn. The women’s title race saw South Africa’s Robyn de Groot and Sweden’s Jennie Stenerhag (Biogen Toyota Cape Brewing Co.) winning the first four stages. But a mechanical on Day 5 saw them lose significant time and the overall lead to Williamson and Pirard, who won Stage 4 and finished second on Stages 5 and 6, both won by Neethling and Stander. Stenerhag and De Groot finished second overall with the Meerendal Wheeler pair of Esther Suss (SUI) and Theresa Ralph (RSA) rounding out the final General Classification podium. In the other team racing categories, South Africans Brian Lennox and Hannes Hanekom (Klein Karoo Giants) won the Amateur division title, while German Max Friedrich and Jana Mischance (Firebike Tomotion by Blacktusk), claimed the overall Mixed title. With 45 finishing teams, the Amateur division was the largest of the race. Heinz Zorweg (AUT) and Bartie Bucher (SUI) of Team Meerendal Wheeler 2 won all seven stages and finished an impressive 11th overall on their way to dominating the Masters (50-years and over) division, while South Africans Johan Labuschagne and Gerrie Beukes (Klein Karoo Veterans) eventually sealed the competitive Veteran men’s category after having to claw their way into contention after a poor start. In the Solo men’s division, Travis Walker (RSA - Kargo Pro Racing) won the title rather convincingly, while Christine Janse van Rensburg (RSA), was finally confirmed as the dominant winner of the Solo women’s category.